Standing tall amongst the ancient ruins of Egypt is the well-known popular attraction of Pompey's Pillar. The triumphal Roman column is the only-know free standing column in Egypt and is also one of the largest ancient monoliths. Explore the artifacts in the site, examine the small sphinxes that surround the column, soak in the history as you walk around the site, and click a dozen photographs of the towering Pompey's Pillar. This remarkable attraction also has a secret underground passage which you should definitely check out. How popular is Pompey's Pillar? People normally club together Antoniades Garden and Pompey's Pillar And Temple Of Serapeum while planning their visit to Pompey's Pillar. Located in Alexandria, this place was beautiful. Our guide explained how its been wrongly named and was made much before Pompei's time. Anyways, we spent about an hour here. The weather was just perfect. Its like a little trek to get closer to the pillar. There's also 2 sphinx here, which make for a perfect setting. There's also an underground library, which used to be world's biggest. Right now it's only ruins but worth a visit. Pretty decently preserved site in the middle of the city. It has pillars and monuments from all parts of Egypt. The pillar has been transported from Aswan in the ancient times and stands tall and proud in the center of the site. There are a lot of other gargoyles that represent ancient Egyptian , Roman and Greek culture. The ticket window person is super rude to tourists considering it's a tourist site and it runs on the revenues from the tickets. 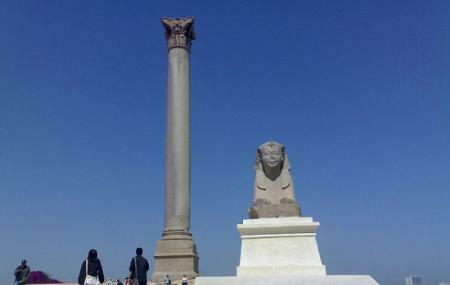 Pompey's Pillar is a Roman triumphal column in Alexandria, Egypt, the largest of its type constructed outside the imperial capitals of Rome and Constantinople. Pompey’s Pillar hewn from red Aswan granite, one of the city’s prime sights is a single tapered stone structure. The column rises out of the sparse ruins of the Temple of Serapeum, a magnificent structure that stood here in ancient times. The column was named by travellers to remember the murder of the Roman general Pompey by Cleopatra’s brother, but an inscription at the base says it was erected in AD 291 to support a statue of the emperor Diocletian. Pompeys pillar is good to watch if you are visiting the Alexandria. Your guide will explain the stories related to it. It's very well preserved in the ruins. Moving up to it involves little ruined steps up from front otherwise there is a long way to reach at top too.